The Daily (Maybe): What's a British job anyway? What's a British job anyway? I know bloggers are meant to come out with instant opinions on any issue that pops up but frankly I've been torn over the recent wildcat strikes and wanted to read up on what people had to say before sticking my oar in. There I've said it, I don't know everything! What the hell am I doing on the interwebs? The dispute originated when a contract to extend the diesel refining capacity at a refinery in Lincolnshire was awarded to IREM who intended to bring its own existing labour force in (from Italy and Portugal) rather than hire local workers. Although the move will not produce lay offs and should not undermine existing agreements (although in reality it might) many workers were concerned that there were British workers who had the skills necessary for these jobs who would not get a chance to apply for these jobs. A Shopfloor meeting in one workplace fed into concerns about the use of overseas workers in other areas and solidarity mass meetings began, in impressive time, to breakout into wildcat (and therefore illegal) strike action right across the country. The dynamism and audacity of these strikes is a joyous thing. 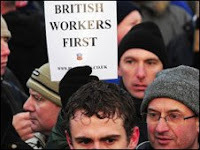 However, whilst concerns about conditions and jobs are legitimate, the core demand of the strikers - British jobs for British workers - is without any shadow of a doubt a reactionary one. It's also a demand that is guaranteed to ensure that it will be impossible to unite the "imported" workers with the local workers - something that should be central to any trade union action. Far from refusing to allow employers to play the "divide and rule" game this strike action deepens the divisions between the workforces. Whilst French workers have been busy focusing their demands on the forces of capital, who have generated this recession, this dispute centers its opposition to employers over who they employ and its opposition to the government over immigration. As many on the left have pointed out working class people have legitimate concerns and that we should not dismiss those very real problems because the slogan makes us uncomfortable. I agree with that, but I'd add that we can't just say some of those concerns are legitimate without detailing exactly which ones are legitimate and which ones are not. There has been some good pieces on this that have suffered from an attempt to pretend that nationalism is not a very real dynamic in this situation. It's really the press, or the government or the employers, or even where workers are clearly playing the nationalist card that's not really what they mean. Well I'm sorry but these workers are quite capable of speaking for themselves and whilst some of their leaders have spun it quite well when given the chance to speak they're clear that the dispute is about foreign labour, not the employers. Not that the BNP will significantly benefit from this among those taking part in the actions, it's notoriously difficult to make any lasting political capital out of "intervening" on picket lines if you don't have people there from the beginning, but they may well benefit from the direction this pushes the wider political debate. They will make capital out of it on the estates even if these workers are almost impregnable. It is not about whether individual workers involved are racists - some will be, some wont, most people will be a mixture of good and bad - but it is about whether the demands themselves are going to lead to driving a wedge between indigenous and migrant labour that would inadvertently undermine the rights of migrant labour and play into the hands of certain employers. We can't afford to turn a blind eye to the nationalist DNA of the strikes and it is to the good that there are some well placed leftists on the strike committees who, if they choose to do so, will be able to lessen the impact that this dynamic has. I hope they will be able to argue for a strategy that can unite with the foreign workers who are living in a "heavily fortified ghetto that is not of their own choosing" (Independent) on a way to unite working people to protect conditions for everyone. "There are principled class demands to be put in this dispute - defence of the NAECI agreement, unionised labour at every site, an end to sub-contracting, the rate for the job for every worker irrespective of their country of origin. These are the issues we should be organising around." Anyone who thinks this dispute will lead to increased workers rights without attacking the rights of migrant workers I suspect is just seeing what they want to see. The goals of the strike are a problem, because they allow the press, the government and the employers to play us off against each other. There is no such thing as a British job and those who believe that the colour of your passport should give you privileges are not our friends. I was sent an appeal from the Campaign Against Immigration Controls earlier (below) and I hope that the two actions they are calling against UNITE take on board the importance of concerns around the undermining of workers' rights whilst raising the important issue of unity across national boundaries. There will be two pickets against the strike for "British Jobs for British Workers" tomorrow morning called by CAIC at the UNITE OFFICES, 128 THEOBALDS ROAD - 5 minutes from Holborn Tube Station. One is in the morning at 7am. This will coincide with a mass meeting at Sellafield where workers are deciding whether to join the strike. The other is in the evening - from 5pm onwards. It is unusual for the likes of us to oppose a strike and we certainly support constructive militant actions to defend jobs, action that has not, in the recent past, been encouraged by the trades union movement. But we believe that, despite protestations to the contrary from the union leaders who are now supporting this strike, that it is driven by and in turn drives hostility to 'foreigners'. If you attend this I'd be interested to know how it goes. Others on this subject are mainly more supportive of the strikes (in no particular order); John's union blog, The Guardian, Charlie Pottins, Jon Rogers, HarpyMarx, Jon Cruddas, Lenin, Vicky, Pickled Politics, FT, Mersey Mike, George Galloway, SWP statement, Workers Power, The Commune, Dave Osler, Journeyman, Chris Dillow, Madame Miaow, Liberal Conspiracy, Duncan, AVPS 1, AVPS 2, Charlie Marks, Liam, Jerry Hicks, The Socialist Party, The Independent, Serge's Fist, Susan Press, Gill George, SSP, The Morning Star, the list goes on... I may post some more up as the mood takes me. A few more; Socialist Resistance, Channel Four on BNP, Permanent Revolution, strikers demands (SP), Morning Star (2), Dave Osler (2). Maybe it would be better to quote some of those in the industry, many of whom are arguing consistently against accusations of nationalism and the employment of that slogan? I think the CAIC picket is shameful, I'm saddened to see you advertising it on your blog. Critical engagement is what's needed, not a long post focusing on the "nationalist DNA" of the strike; Charlie Pottins' take on the subject (and the slogan) is exemplary. *the re-instatement of John McKewan, a strike committee member who has been victimised out of LOR. thoughtful post, Jim, I have been pondering it too. There have indeed been some good statements from the organisers of the dispute (as I said in the post, which I agree was longer than I'd prefer but it was late and I didn't want to spend my whole life writing it) however there have been some obnoxious statements too, the worst one I've heard so far was earlier today on Radio Four (ie after I'd written this) which was pretty foul. But my argument doesn't rest on whether the individuals are racist (some will be, some certainly are not) but what effect this dispute will have on politics in this country. I guess one of my concerns is that much of the left discussion has focused on the three or four thousand strikers without discussion of the one and half million EU workers in this country and million and more others who are migrant workers from further afield and will be watching this dispute with "great interest". Will the outcome of this strike put them in a better position? I actually doubt it very much. I'm not trying to formulate a "line" on this as I think that would be pretty sterile and as none of these strikes are taking place anywhere near me I'm not going to be influencing these workers, unlike the small core of SP members who are at the hub of this and it seems from afar have had a very positive effect - but on a personal level I do want to square the circle of my pleasure at seeing such swift and effective direct action and the core dynamic where one set of workers say they have more right to work than another based on their nationality.